Rick Johnston leads the WHO half of the WHO/UNICEF Joint Monitoring Programme for Water Supply, Sanitation and Hygiene. Before joining WHO in 2013 he worked at Eawag: the Swiss Federal Institute of Aquatic Science and Technology, and at UNICEF. He has over 25 years of experience on WASH in low- and middle-income countries, with a focus on monitoring and drinking water quality. He graduated from Grinnell College and holds degrees in environmental engineering from the Johns Hopkins University and the University of North Carolina at Chapel Hill. 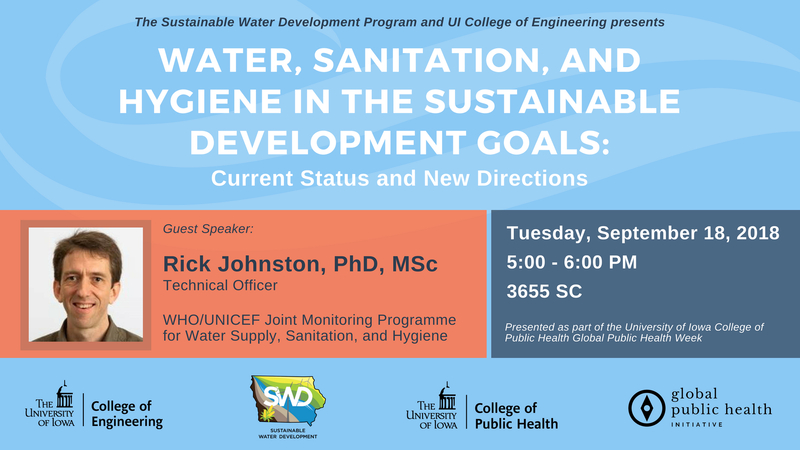 This guest lecture is presented by the College of Engineering Sustainable Water Development Program in conjunction with the College of Public Health Global Public Health Initiative.